The services of an air-conditioned vehicle (depending on the number of participants) with experienced driver. A glass of Ouzo with “meze” at a seaside simple “Meze” tavern near Cape Sounio. 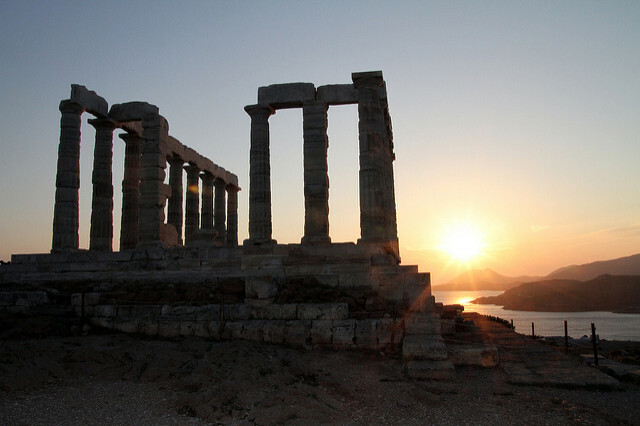 Enjoy a lovely - out of the ordinary - tour to Cape Sounion, one of the most famous sites of Attica Region; located just one hour away from Athens, in the comfort of a private or semi-private luxurious vehicle. The tour has been specially designed to get you to the Temple of Poseidon exactly on time to experience the world famous sunset, but also, to give you the opportunity on the way, to get to know some of Athens’ most beautiful suburbs and natural beauties. Start your afternoon journey for the discovery of Athens’ suburbs, in the comfort of an air-conditioned, luxury, non-smoking vehicle, on a private basis. Drive along the beautiful coastal road and enjoy the magical scenery that unfolds before your eyes: Lovely seaside promenades, yacht harbours, coffee places, stadiums and natatoriums, mansions and beautiful buildings while in the background, the deep blue color of the sea fills your eyes. Leaving the Athenian Riviera, your drive will continue through the equally beautiful seaside road: Small villages and summer settlements, sailing and fishing boats crossing joyfully the Saronic Gulf and numerous little islets scattered in the deep blue horizon. After a brief photo stop at the right place to capture the Temple of Poseidon and the wonderful Aegean sea from the correct “angle”, you will arrive at Cape Sounio. No wonder why the ancient Greeks chose this place to build the Temple of the God of the seas. The Temple of Poseidon awaits you with the most astounding panoramic view of the Aegean. After having captured the beautiful colors of the sun diving into the Aegean sea, you will re-board your luxurious vehicle and drive to a nearby sea-side simple “Meze”-Tavern, where you will enjoy a Greek aperitif (Ouzo) with some “mezes”, the Greek tapas. Return back to your hotel following the same coastal road, after having enjoyed a Greek-style aperitif by the sea and having captured the magic of the sunset and the romantic scenery with your camera, your eyes and your soul... These are memories that will last a lifetime! -Add extra time to your tour and enjoy swimming at the nearby free beaches, dinner or lunch! -Add lunch or dinner to your tour: You can enjoy a beautiful “Meat” or “Seafood” menu at the same simple but lovely tavern where you’ll have your ouzo and meze. You can add that by clicking on the ''Book now'' tab above. Please note: Meals can NOT be cancelled and refunded separately from the tour. Meals are cancelled only if the booking of the tour is cancelled as well. Your driver will meet you at the reception of your hotel (the exact time will vary according to the time the sun sets on the day of your tour! The pick-up time is set approx. 2 hours prior to sunset. The exact pickup time will be given to you upon reservation). Being a private tour, the departure time can be adjusted to any time you’d like and the tour can turn from a sunset one to a morning or an early afternoon one! Just let us know of your preference upon booking! 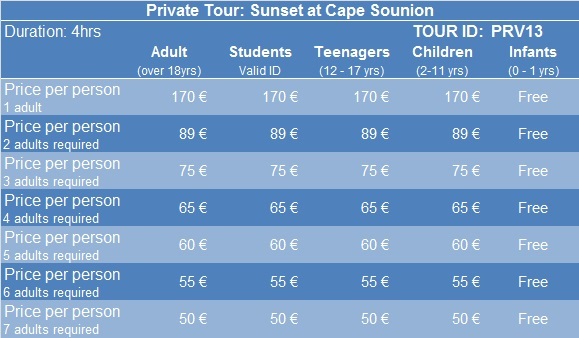 Entrance ticket to the Poseidon Temple is not included in the tour's price. For more information on the Entrance Fees to the Archaeological Sites and Museums please click here. Approximate duration of the tour: 4 hours. Driving time: 2 ½ hours. Time spent at the Archaeological Site of Cape Sounio: Approx. 45 min. Time spent at the “Meze”- Tavern: Approx. 45 min. Confirmation will be received at the time of booking, including exact pickup time information. DAILY SERVICE from May to September. Does not operate from October to April. The tours do not take place on the following public Holidays: Easter Sunday and May 1st.